This has to be done while things are still clarion. Visuals etched on the cerveau, still. Light, shadows, whisperings of fabric: breaths combine into the performance. Good programming, like good visual art, is work for the audience. Programming a recital –deciding on the pieces and their sequence — is the first artistic act. In the assemblage, the collage, some kind of messages are newly encoded which extend beyond each discrete score. In other words, it is in the relation of one work to the next that connexion is formed, sparks scattered on the ground, conflict and structure sown. My pianist, Robert Jorgensen, is a kind of musical savant; I had no idea why I had agreed to his program order, but now having performed it thrice, I became a convert. I began to consider the benefits of an unconventional program order of apparently conventional elements. To explain: Standard practice would have suggested that we open our program with Beethoven, move on to Faure, interlude with Nadia Boulanger, and then end with the monumental Brahms Cello Sonata No. 1. But Robert argued that we start with the French modernism and end with the Beethoven. Starting a program with French modernism is murder hard, but it immediately confronts the audience with a challenge: you are here to think! Furchten sie denn! And having emerged through our thickets of primitivism and chain-mail Brahmsian counterpoint and cross-rhythms, we, an hour later, endow you with Beethoven, with a kind of diatonic paradise. The world well known to Goethe opens up at the peak of a reverse ascent through centuries. Turn pages for your pianist. He plays a solo interlude in the middle of the concert. Turn his pages; you bond this way. When the sixteenth notes quit trembling, you look at the back of his hands. You understand the way he moves. You listen to him breathe; begin to intuit his gestalt, the musical instinct. Sit back in the chair. Don’t just look casual, be casual, like an Austrialian with full square kilometers of time. Be on the stage, be of the stage, but sense your heart rate at rest. A kind of home is to be found under the traveler’s firmly immobilized treads. Finally, you are the only invisible observer, guiltless and at rest. Everyone wants to be the cellist. You are either king of the world or a cornered victim. Particularly at the outset of a solo concert, this dichotomy is stark. Joy and self-love has to conquer, or your performance will degenerate into a sea of exponential errors and bad faces. 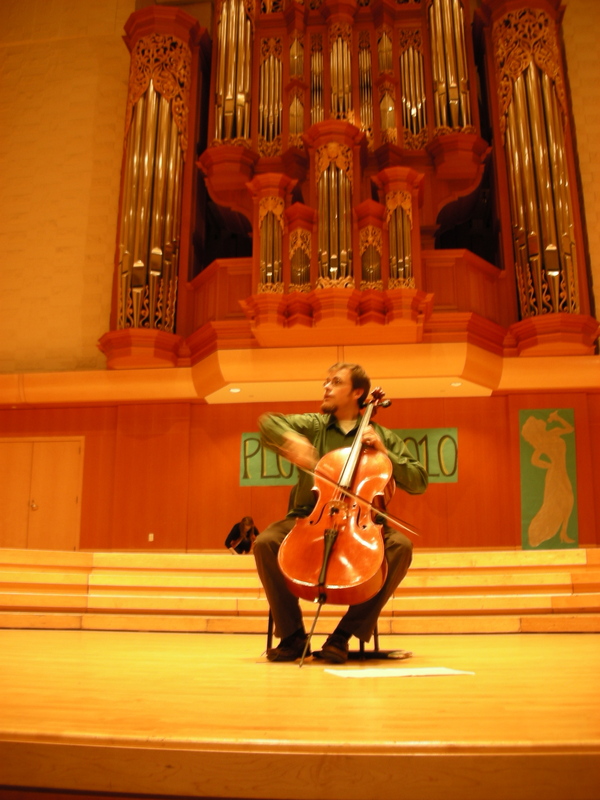 The cellist Peter Howard described to me his lessons with Casals by way of saying that you have to be absolutely in love with the sounds that are coming out of your instrument. “You should love your playing so much that the hair stands up on the back of your neck, you know?,” he said to me one day in St. Paul. “If you don’t, how do you expect anyone else to love it?” It takes practice to feel regal, but your music was written for emperors, and for once, no one is looking at their phone while you play. You must have been bequeathed some right, some dispensation to experience joy, to believe that out of your f-holes is pouring some kind of liquid gold that is entwined with some rare DNA. A jumpy Arminian violinist, Vartan Manoogian, once advised me that “everything is preparation.” Sure, but once the preparation is done, then what? Performance requires the construction of a mentality, sovereignty of one’s mental world. It requires that the performer espouse an emotional attitude toward himself. The skills so necessary for effective practice — autocritique, the piercing ear, the anger at one’s self, the ability to stop and go back, stop and go back — can be completely destructive in a performance situation. Fear is not an option, and going back is impossible. Capturing lost notes in a performance by going back and starting over would be like trying to capture a lost love affair — which is to say impossible and potentially embarrassing. So the solution is to love how you sound, to wrap everyone in it, to somehow relish and delight in the beauty of the music you are creating or embodying. Aggressive self-love is the only antidote to the contagion of loathsome critique. Listen to Maxim Shostakovich and his dad: at the very least, have the pride of a soldier. Never victimize yourself or admit you hated the sound that just came out of your axe. If you are worth anything as a teacher of cello, as a pedagogue of how to spend one’s time well behind the axe, you talk to yourself. You critique yourself, you curse. And in the practice room, if you are unable to attack your own physical set-up verbally, to take apart why a given passage isn’t working, to beat your head against a mirror or a white concrete wall to demand more, you can hardly expect success. But during a performance, never project external critiques upon yourself. There is nothing more damaging than a constant stream of mental imaginings of what the audience must be thinking, as if your performance were prompting a kind of virtual — and negative — Twitter feed. “Oh, that was out of tune,” you imagine them saying. “God, he really butchered that shift, didn’t he,” they might say just two bars later. “Isn’t the sound he’s making thin and pushed?,” the Greek chorus of string critics in your head might wish to say. Which is why you need to find other things to do with your mind during the performance. Sometimes you are alone, playing purely for yourself. In performance of music, the artist must be able to burrow down with rapidity into an inner world where the emotional voices don’t leap up for rapid display. There are things which only you know, fragments of language only you understand.